Summary: This walk came top of the list when I put an enquiry on a walking newsgroup asking for the best walk in the Peak District. With highlights including Gradbach, Hanging Stone, Lud's Church, Roaches and Hen Cloud it certainly justified the replies to my question as being the best single walk in the Peak District. 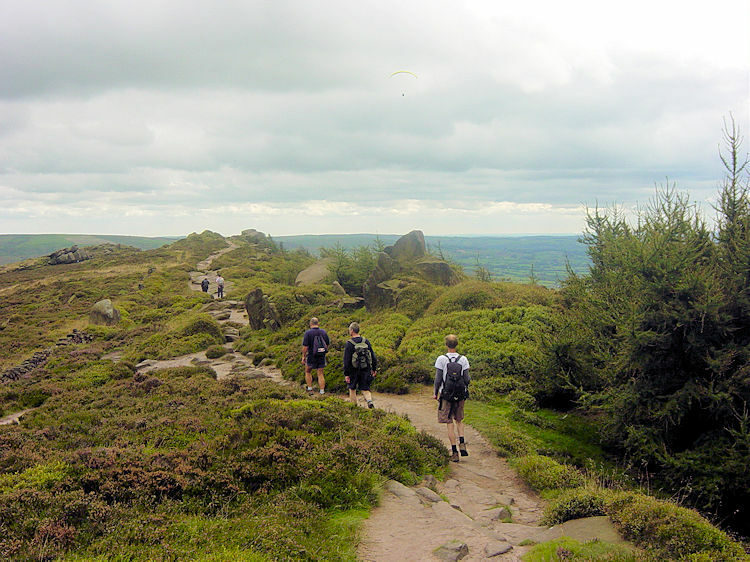 It is a classic popular Peak District walk. The Walk:I had told the lads all about how I came across today's walk. 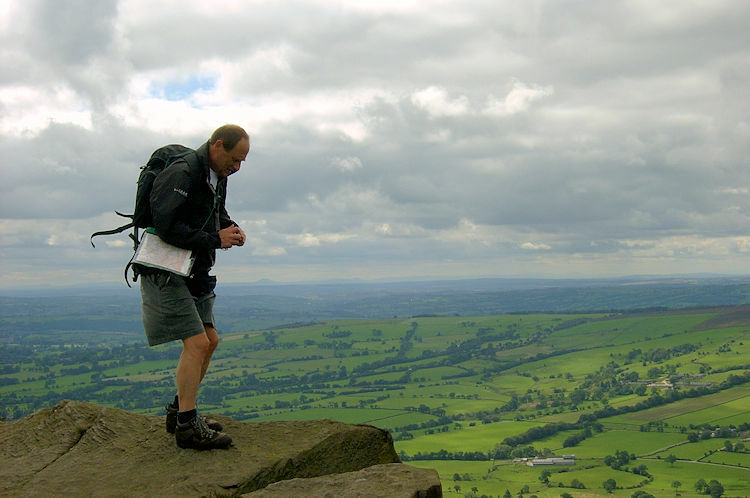 I had posted an enquiry on a walking newsgroup asking for recommendations for the best walks in the Peak District. Of the replies I received this walk was clearly rated number one. Acting on the replies I planned out a route that would complement a good days walking and take in all the recommended features. 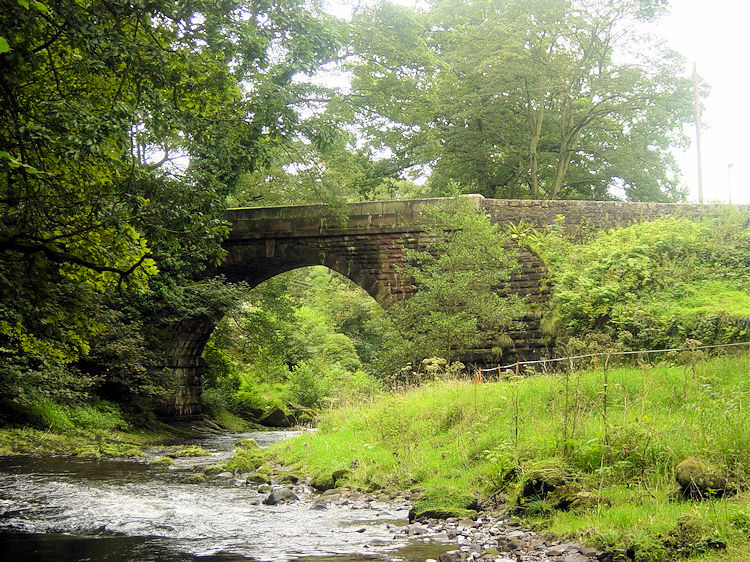 And so, after a good night out in our base at Buxton we had a lovely breakfast at our digs and drove to our start at Gradbach just off the A53 Buxton to Leek road. 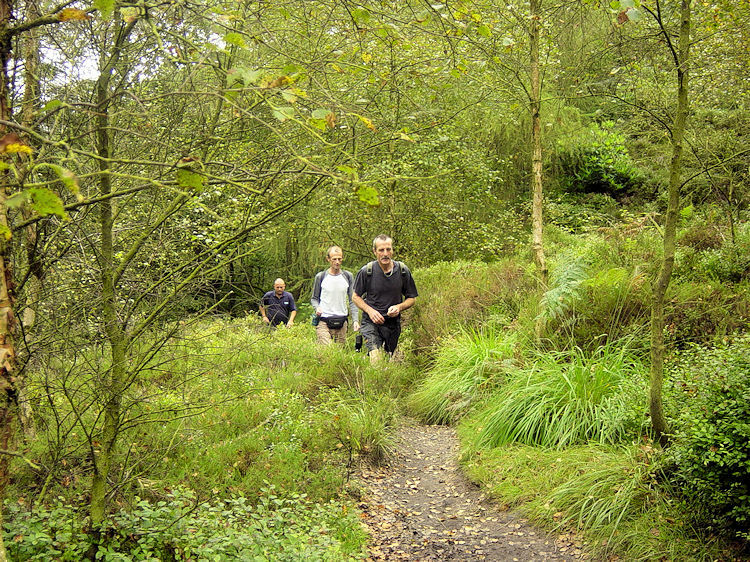 The beginning of our walk took us past the Gradbach Youth Hostel and into Gradbach Wood. 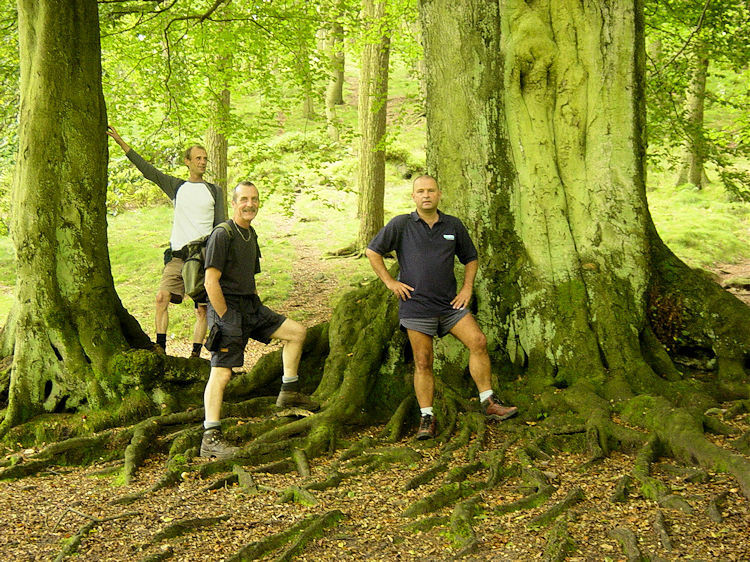 The walk on the Dane Valley Way through Gradbach Wood and Forest Wood was fantastic. The path followed the course of the River Dane through delightful woodland for about a mile until we emerged from the woodland and crossed open land for a further mile before entering more woodland at Back Dane. Although the walking was steady with gentle undulating terrain Dave's sciatica began to play up again. He was clearly suffering and had to administer the Deep Heat. He was not for quitting though and after his temporary repairs we walked on the Danebridge. We rested on the river bridge for a while for there was a stiff climb coming up immediately after our break and it was a break Dave needed. The climb was to take us to the Hanging Stone. I had read about the Hanging Stone before the walk and learned about a memorial plaque attached to the stone. We walked steeply through the woods with Dave valiantly striving through the pain barrier to keep up. I tried to encourage him during the woodland ascent saying it was his destiny to touch the Hanging Stone. Finally we emerged out of the wood over a stile on which Steve commented "That is the last thing you want, a stile after a climb like that". We were all panting heavily but at least we were out of the woods and although we were still climbing after crossing the stile it was less steep. And now we could see the Hanging Stone. It is aptly named. 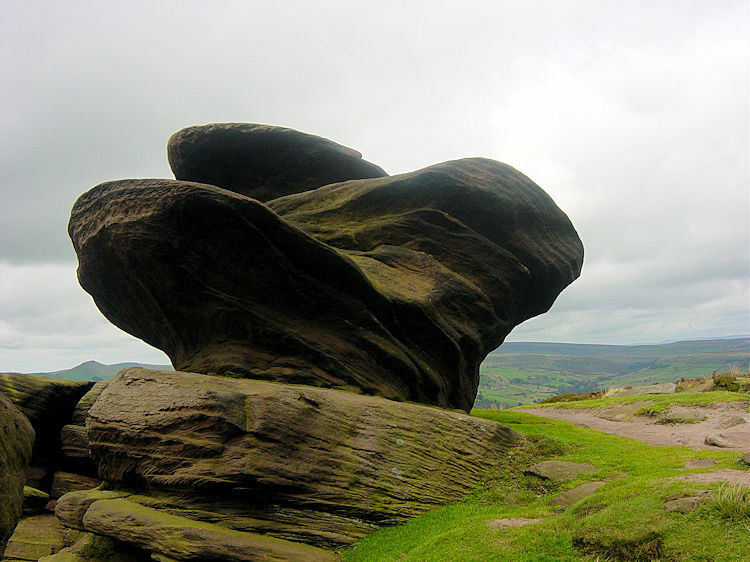 It is formed of layers of grit stone with a large flat slab laying on top of the others with a significant overhang. There are no other stones of any size around it so the impact is accentuated. As we approached it I realised it sat above the track we were taking, at about 100 yards away but steeply upwards. I knew Dave would not be leaving the track. Would Steve and Joe? Soon I realised it was up to me to give the Hanging Stone close inspection. My three colleagues remained below as I climbed to the top of the stone and then back down again to read the plaque. It was a memorial to Henry Courtney Brocklehurst, not quite a namesake of Dave and I but close enough. He had led a full life including a spell in the Royal Hussars and being a pilot in the Royal Flying Corps during the First World War. Between the World Wars he was a game warden in the Sudan. He was killed in Burma in 1942 during active service at the age of 54. A remarkable man. The difference between his life and ours in a time difference of about 60 years is staggering. After my visit to the Hanging Stone I walked back down to the track and rejoined the lads. 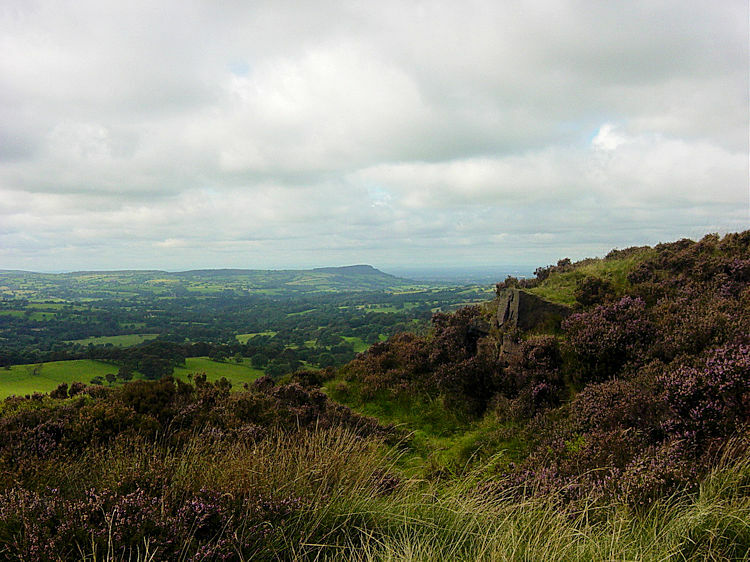 We walked up to the High Forest ridge which followed a course to our main target of the day, the Roaches. As soon as we reached the ridge we had a choice to make. I had planned to walk back down towards Back Forest. This was where we would find Lud's Church but Dave was not up to walking down off the ridge and back up again. I was for staying with Dave but he insisted we must do what we had planned and said he would meet us further along the ridge after our visit to Lud's Church. We agreed a rendezvous point and then walked down off the ridge on the track while Dave stayed high. The walk down off the ridge quickly took us into the higher reaches of the wood and once in the woodland we were soon joined by several groups of walkers. 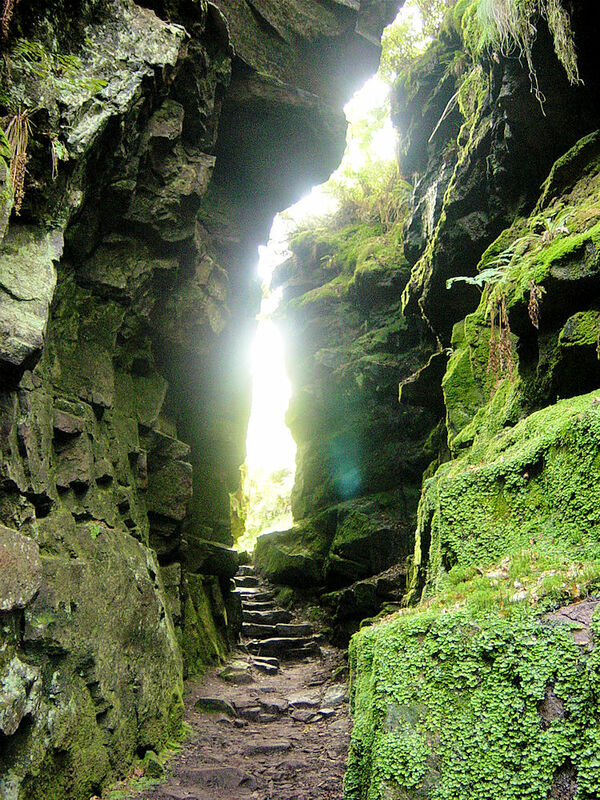 The reason for their presence was clear once we walked into the beginning of Lud's Church. 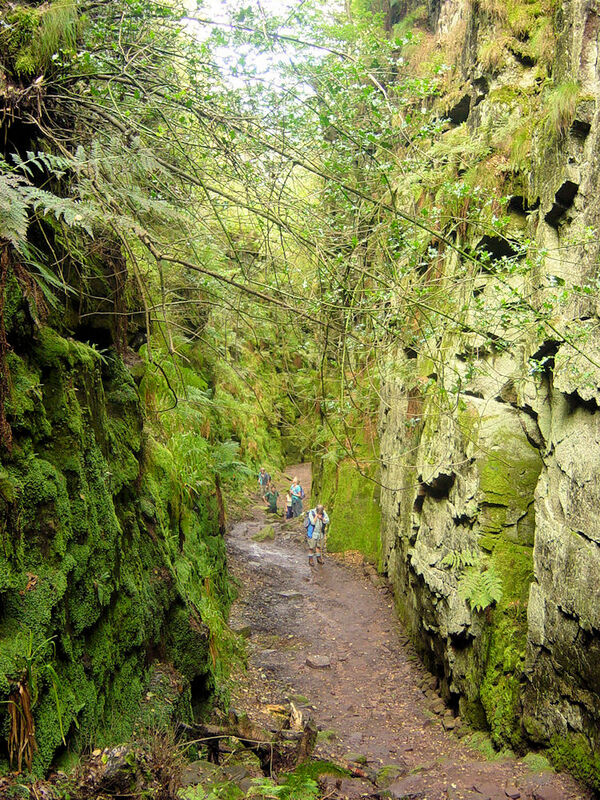 The church is a natural narrow gorge about 100 metres long with both sides rising to 15 metres high. It is a stunning place which we enjoyed walking through. Thank you Dave for insisting I stuck to the planned route. The walk through Lud's Church was a steady climb and this continued through the woodland until we met a permissive path back onto the ridge. We left the woodland into bright sunshine. "Burn, burn!" uttered Steve. It was blooming hot as the early September sunshine beamed down on as just as we were doing our hardest work. Luckily it was a short haul up to the ridge. On reaching it we soon spotted Dave resting a little further up the ridge. He was heartier than when we had left him. He had rested a while and we were now at height although a little more had to be gained as we passed Roache End and climbed up towards the trig point on the Roaches. 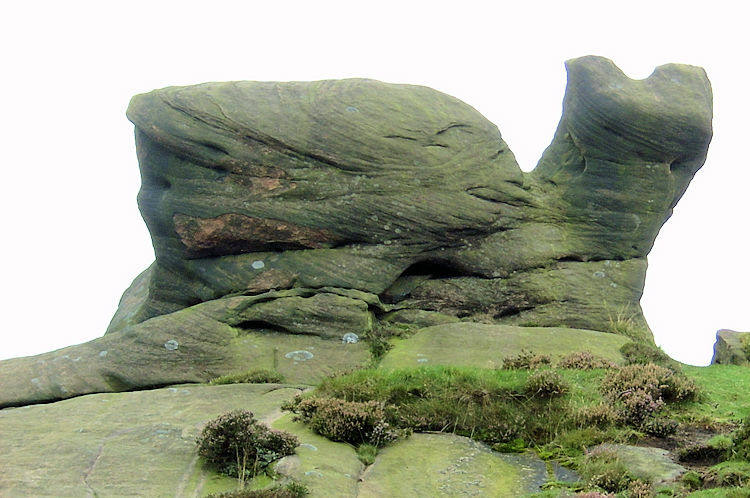 Just short of the trig point we stopped for lunch amidst some marvellous shaped large rocks. It was a lovely place for a picnic. The break for refreshments was most welcome and afterwards we climbed up the ridge to the trig point. 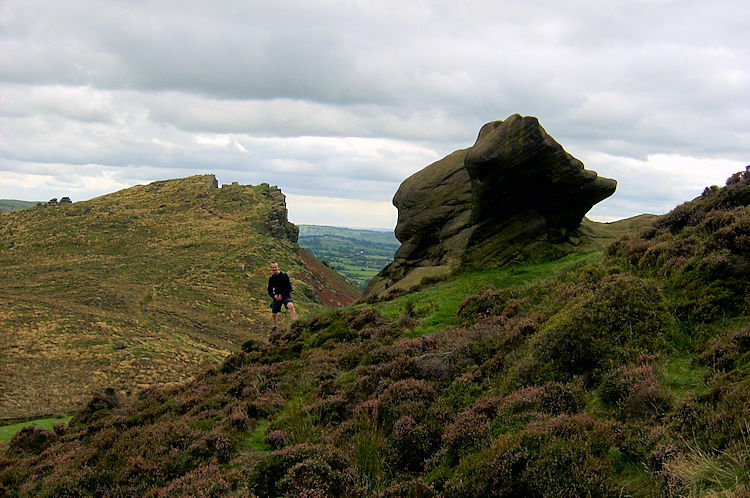 We were at the beginning of a long gentle ridge walk along the Roaches amidst fellow walkers, rock climbers and hang gliders. The views were excellent and although the sun popped in more than it came out there was excellent visibility during our time along the ridge. We spotted the Jodrell Bank dish over towards Macclesfield and hills further afield which we speculated must be on the Welsh borders. 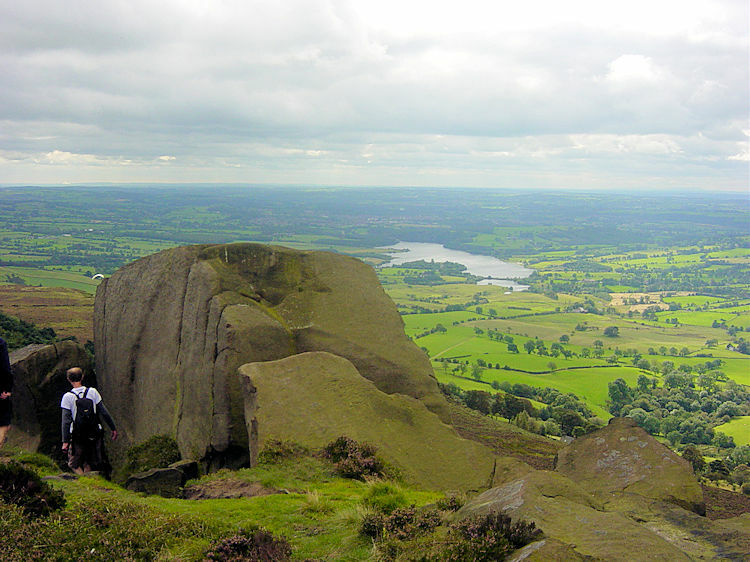 More locally were superb views of Tittesworth Reservoir and Leek. 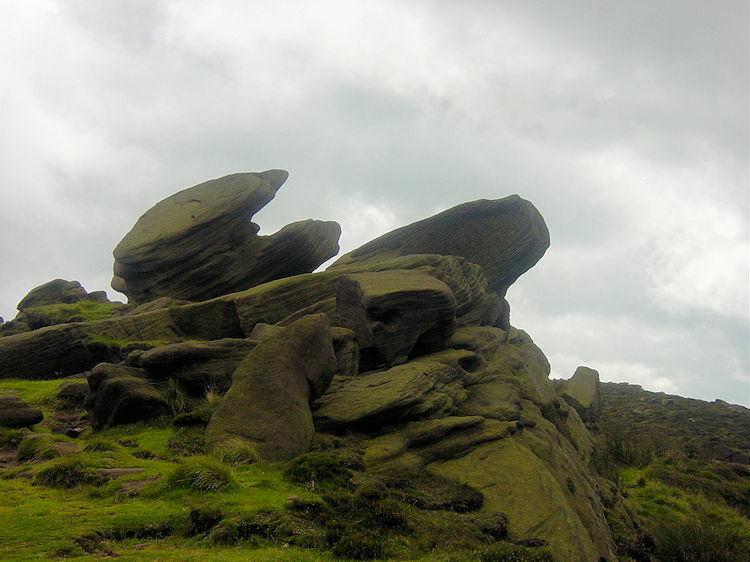 Even closer were the eccentric shapes of some of the boulders on the Roaches like the one pictured that resembles a snail. 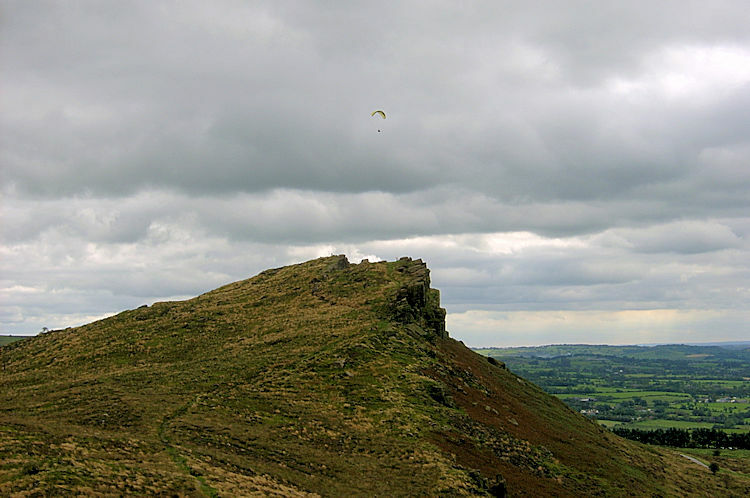 Over the western edge of the Roaches the rock descends steeply down, almost vertical in places. Here there were lots of groups of rock climbers working their way up the rock face. Ropes were hanging from almost every convenient boulder. A solitary hang glider hovered in the sky above. In fact the hang glider seemed to be up there all day, some time later to be joined by a second one. A little further along the ridge a girl was attempting to climb a rock without the aid of ropes. We were impressed until she began her challenge and kept falling off. She never seemed to get off the ground at all. All this activity and the excellent views took our attention along the Roaches ridge to the point that we reached the end of the ridge without noticing. What we did notice though was the next climb facing us, the climb on to Hen Cloud. 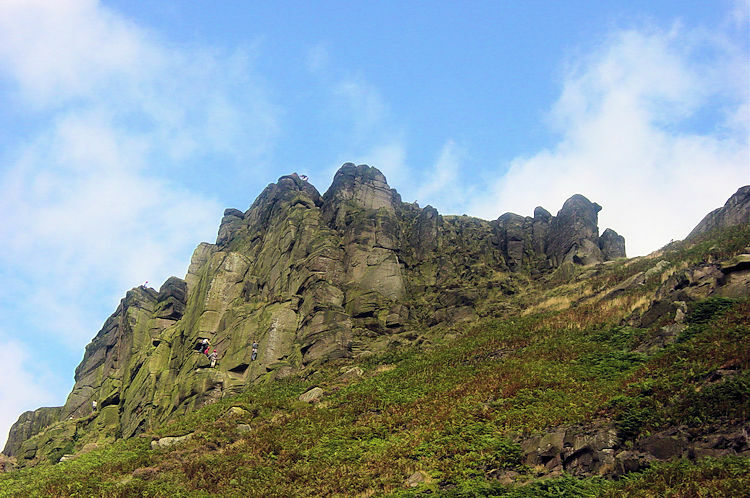 Straight down off the Roaches and then straight up Hen Cloud. This was followed by another break which was shortened by an invasion of flies. I checked the map before we moved off Hen Cloud. 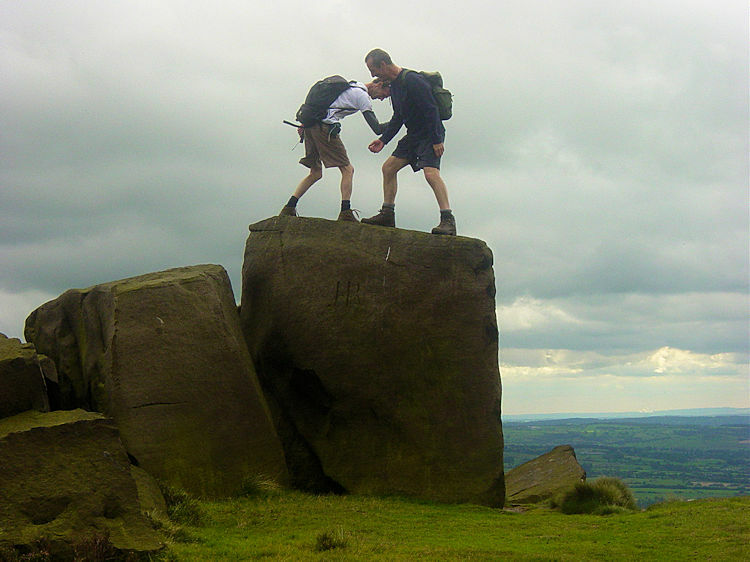 The intention was to cross land to Ramshaw Rocks. Let the fun begin! The path off Hen Cloud was steep and not very clear. I had planned a marked path to Ferny Knowle but we did not find it. 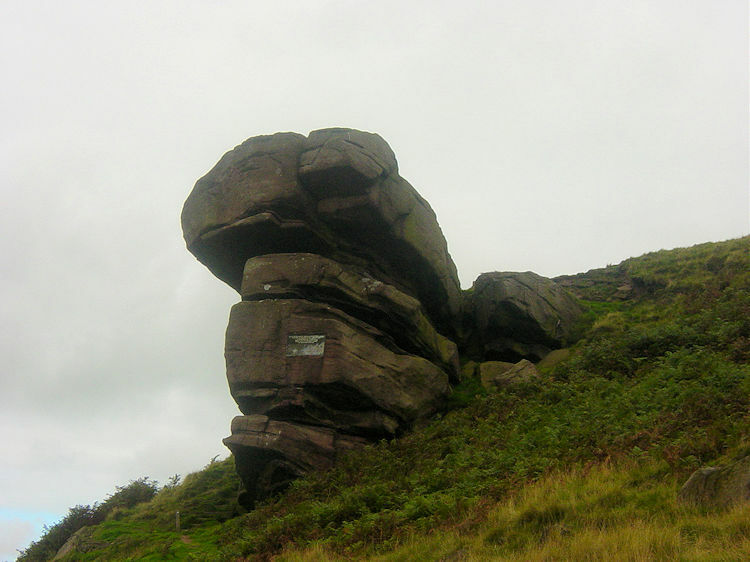 Instead we ended up walking though Roaches House and along the road towards Upper Hulme. At least this walk took us past Roaches Cafe where we enjoyed a lovely hot drink and a conversation with a happy elderly Canadian gentleman who was visiting his three daughters in England. He was overcome with the beautiful scenery and told us so. It was a nice chat. After drinks we walked into Upper Hulme and just as we were leaving the road to follow a track the Canadian and his daughters arrived in their car. We passed pleasantries again. Then we began a climb on a marked path which became less distinct the further we followed it. Nobody had walked it for ages and the stiles we in disrepair. 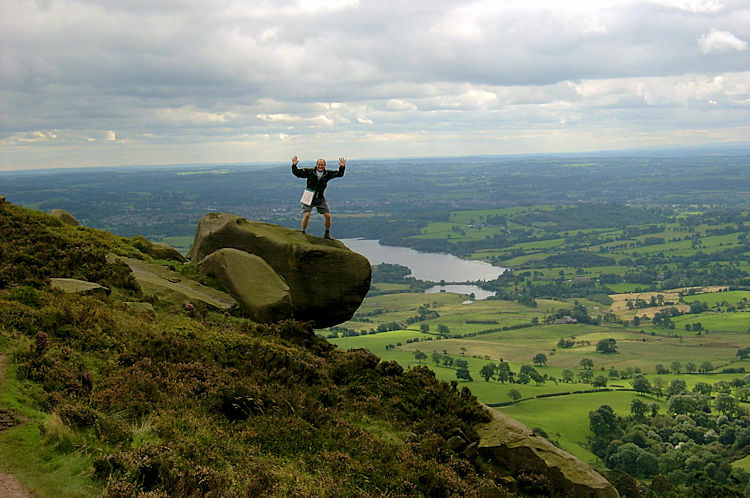 We gave it up as a bad job and climbed up to the road at the edge of Ramshaw Rocks. The rocks were a climb too far for all of us now and we followed the road to Blue Hills where there was a blue house. On the road walk the Canadian and his daughters passed by again. We said hello for the third time. From Ramshaw Rocks I had planned a marked path to Gradbach Hill back to the car. Again the stiles looked forlorn so we decided to follow the road back to Gradbach. It was a nice quiet road walk and the scenery was nice enough if not on the grand scale of earlier in the day. Just before Gradbach Joe and I took a path through fields and woodland towards the car. We had forgotten about the river. With care we crossed at some a shallow spot while Steve and Dave, now back at the car, taunted us. We made the river crossing safely. A fantastic walk fulfilling all the promise I had been told about was done, a truly excellent walking day out. Then we drove back to Buxton via Flash. Road signs stated the village as being the highest in Britain. We doubted the claim. "What about those in Aviemore" said Joe.